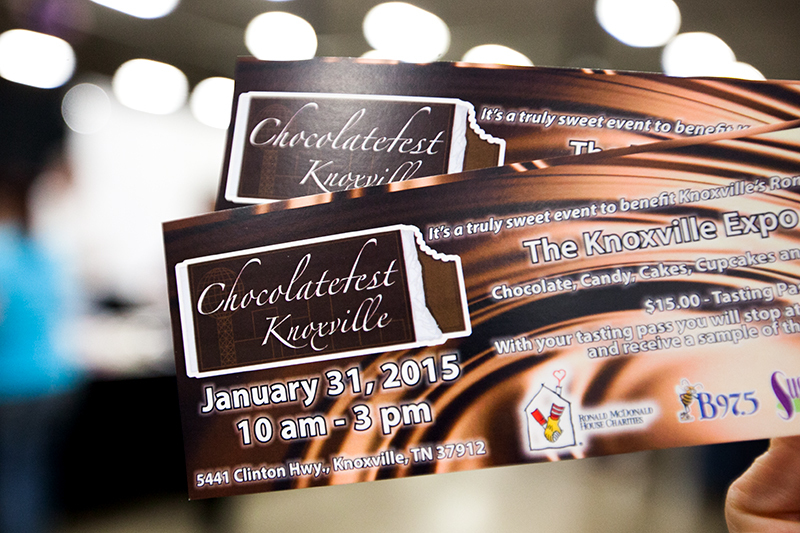 Chocolatefest Knoxville was an annual event for about 25 years. 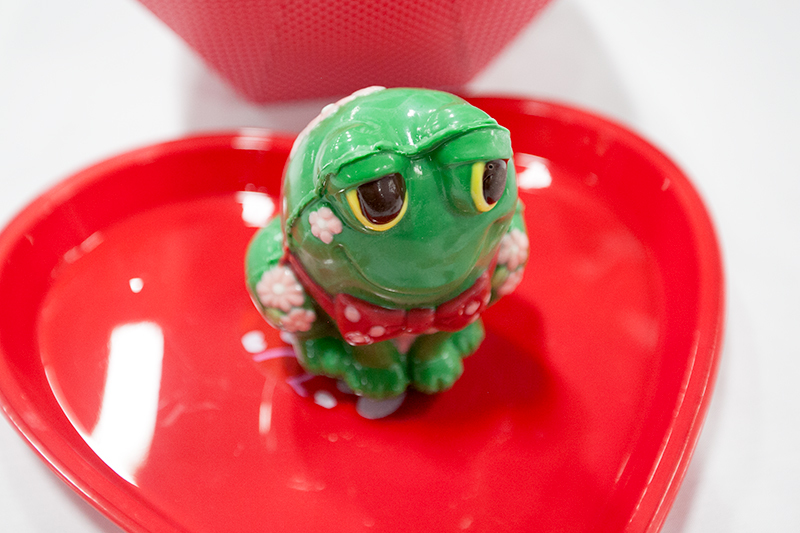 It took a leave of absence and returned again in 2014. 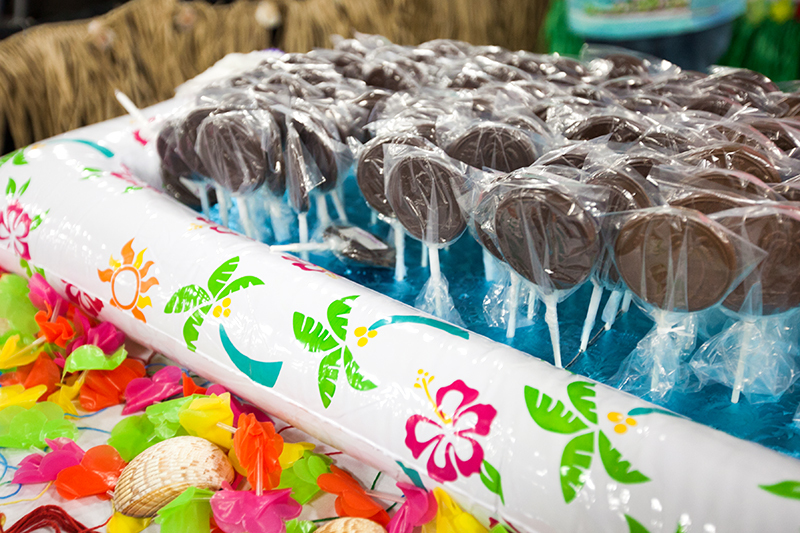 A portion of the proceeds from the event benefits Ronald McDonald house and organizer Jennifer Johnsey hopes to continue to grow and improve the event. 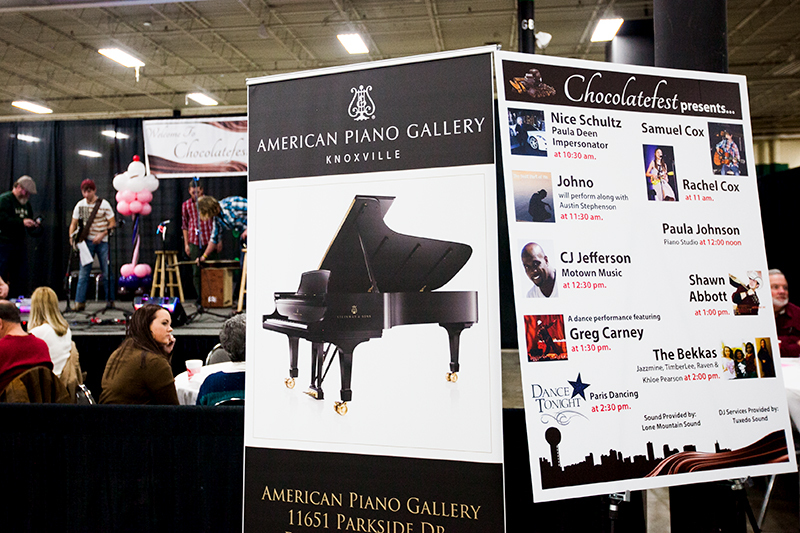 We love attending local events that take place in our charming little city – especially those that center around food – so we packed up our little family of three and headed to the Knoxville Expo center to see what it was all about! 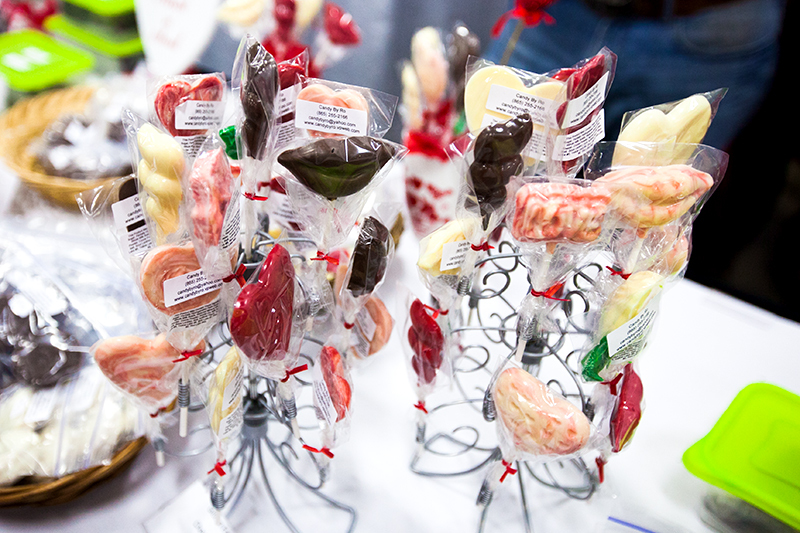 Admission to Chocolatefest is free so you can go inside and browse the sweets, chocolates, and other things for sale at each vendor’s booth. 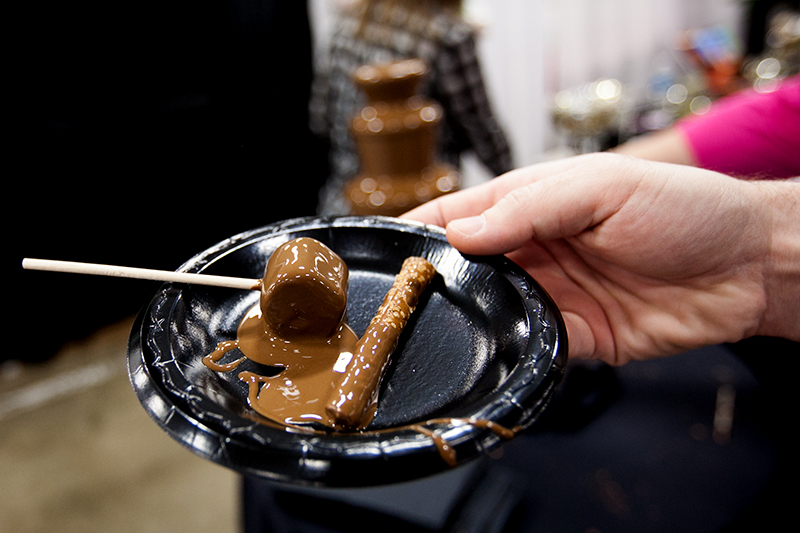 For $15 you can purchase a tasting pass which allows you to stop at each booth and receive a chocolate sample. 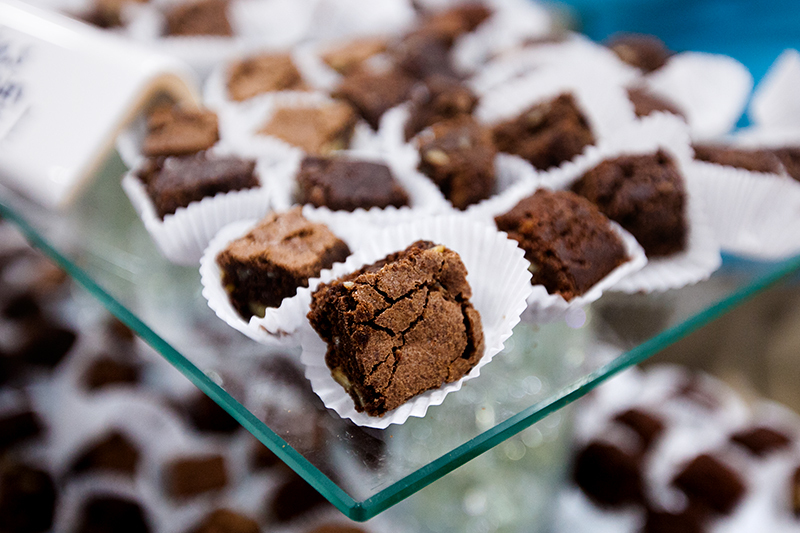 For $30 you can purchase a VIP pass which means you get to sit at a table near the entertainment stage while the chocolate samples are brought right to you. 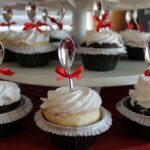 I’ve included links to Facebook pages or websites for all of the vendors, so please check them out and help support our local small businesses! 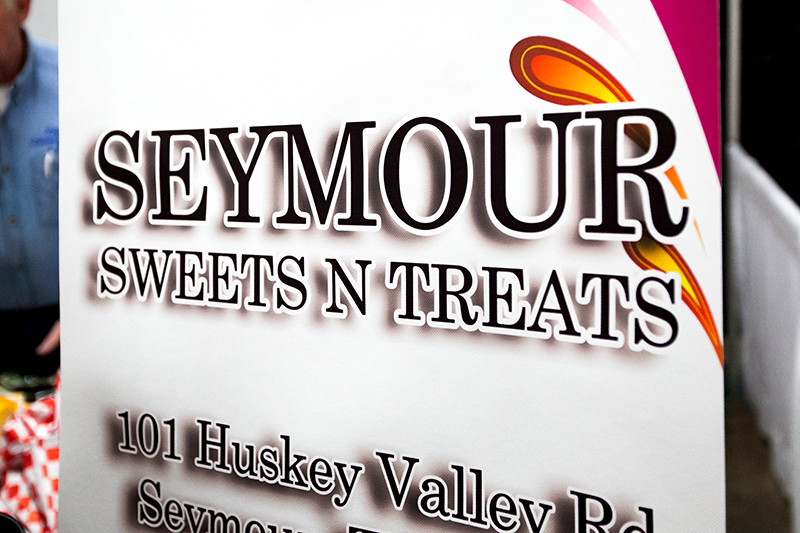 Seymour Sweets N Treats was our first stop. 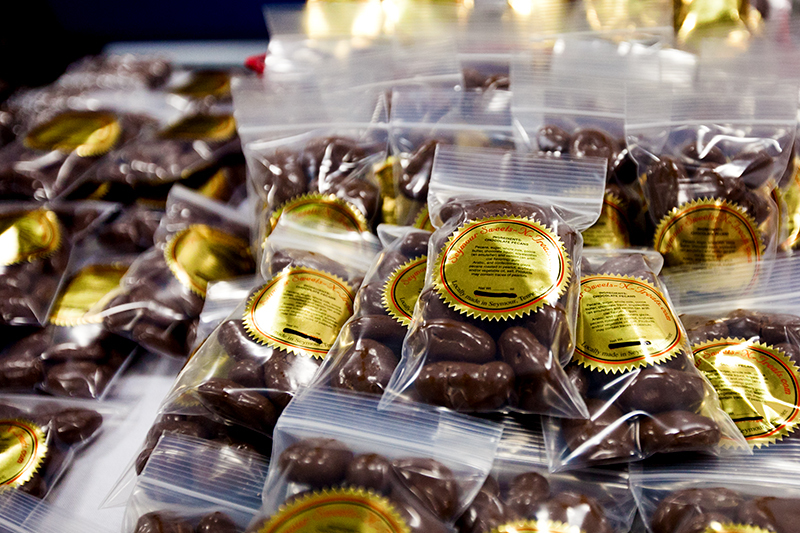 They had an assortment of chocolate covered nuts and rock candies for sale. 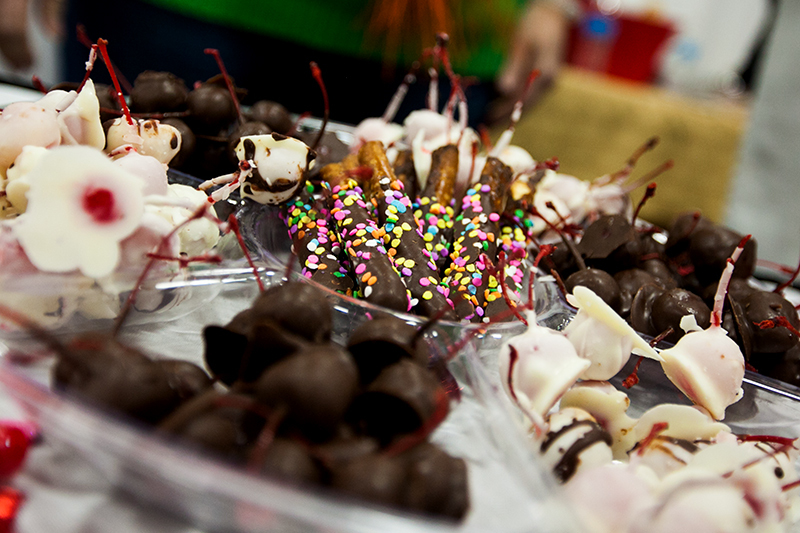 Samples included a choice of chocolate-covered and candied nuts as well as the rock candy. 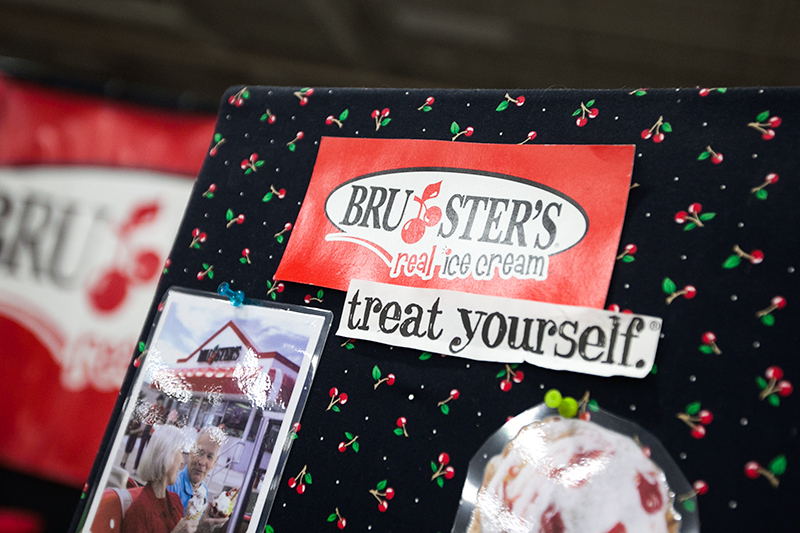 Next stop was Bruster’s, a well-known ice cream stop that we frequent during the warmer months! 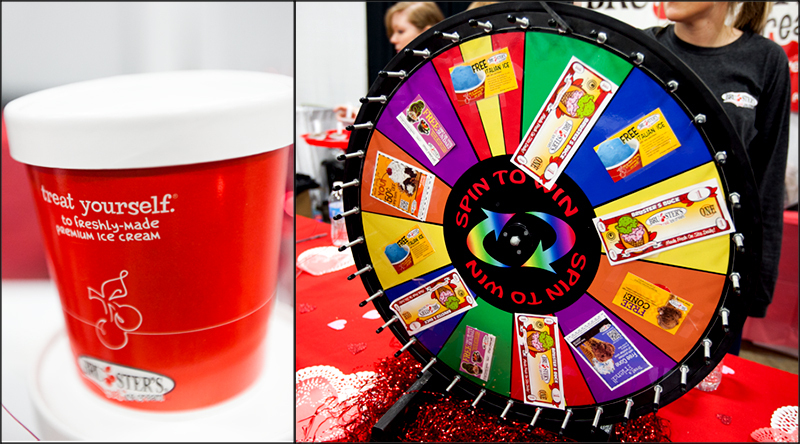 Attendees could spin the wheel to win a coupon or free ice cream. 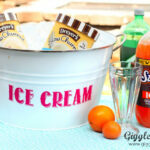 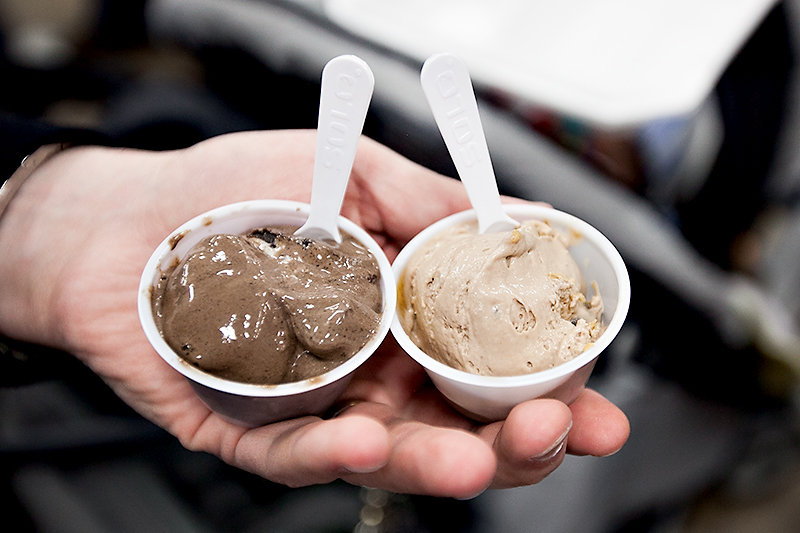 Samples included a choice of mudslide or chocolate peanut butter buckeye ice cream. 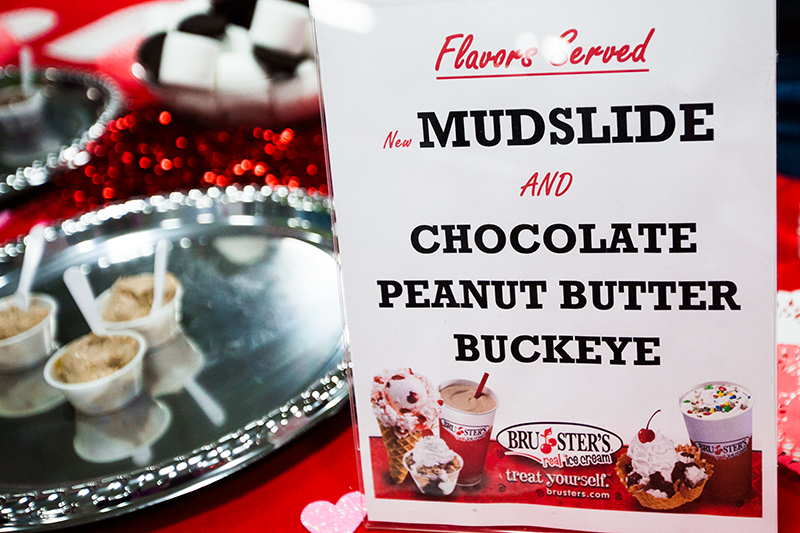 The mudslide flavor was Hershey’s Special Dark cocoa and syrup, marshmallow, brownie chunks and bits of Oreo cookies. 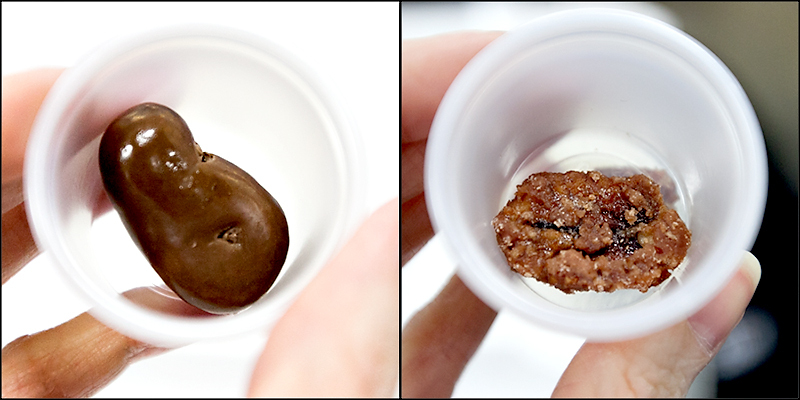 Peanut butter buckeye is peanut butter ice cream filled with mini chocolate-covered peanut butter candy pieces. 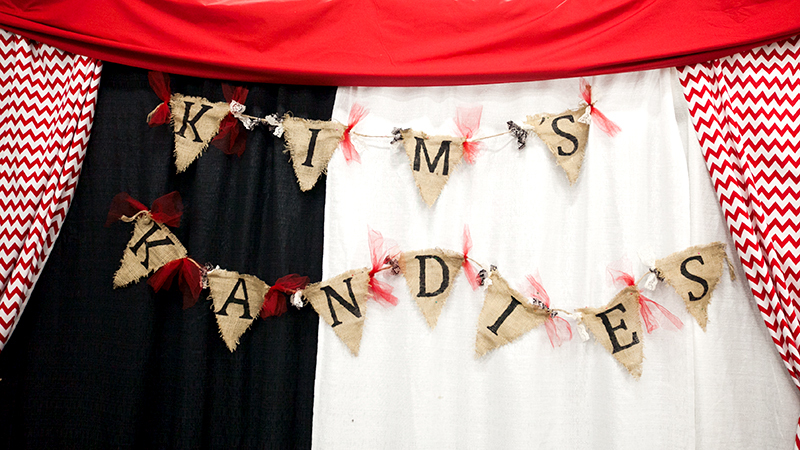 Kim’s Kandies was the next booth in line. 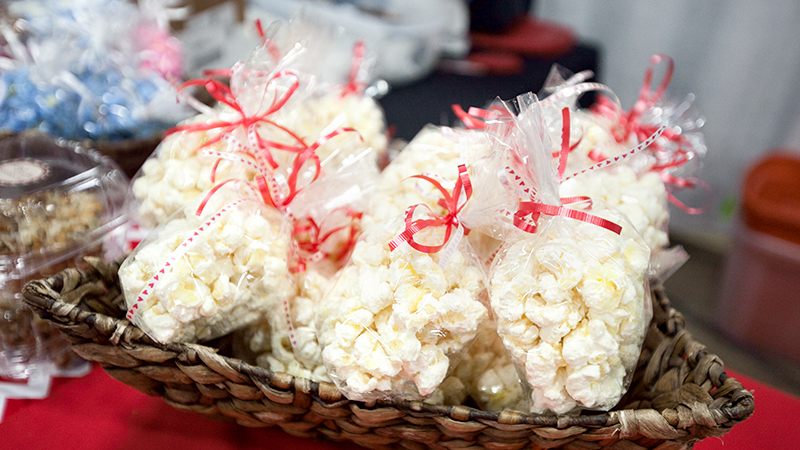 Bags of white chocolate covered popcorn for sale. 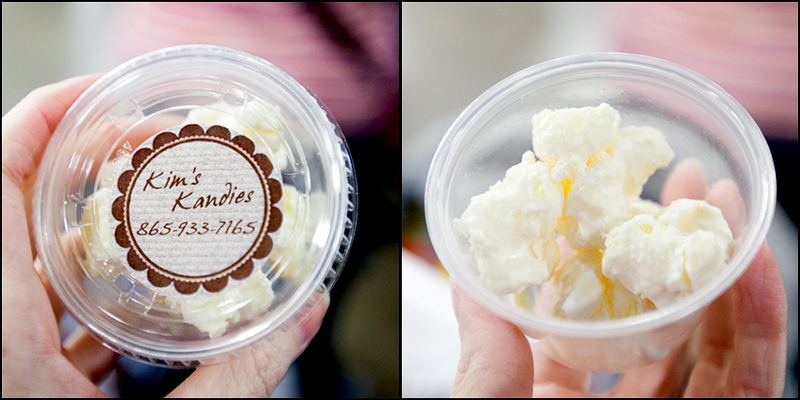 The samples at this booth were cups of white chocolate popcorn, which had buttery corn puff centers. 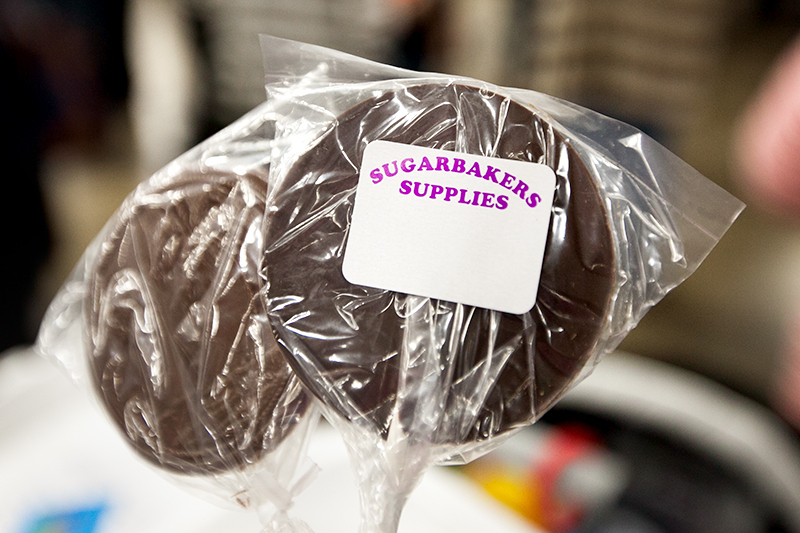 Sugarbakers is a cake and candy supply shop that I’ve visited several times – it’s so fun to browse around in there. 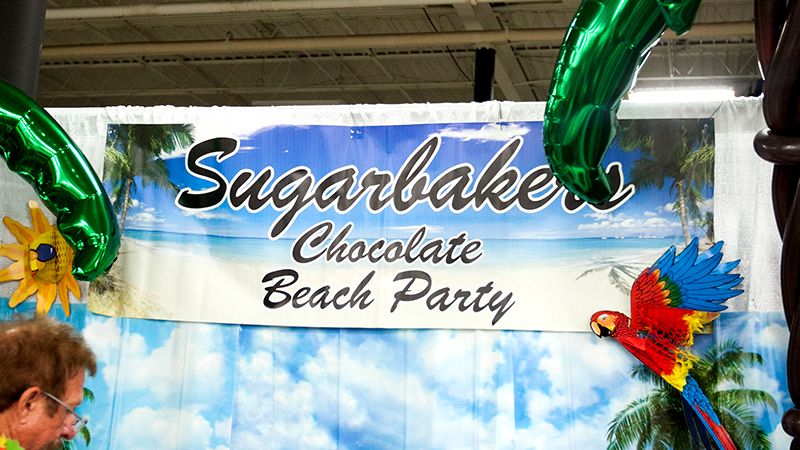 Sugarbakers had a beachy themed booth and were giving out leis along with beach print chocolate lollipops. 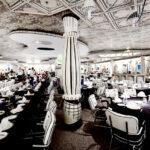 Next we arrived at the back of the show floor where the VIP seating and entertainment stage was placed. 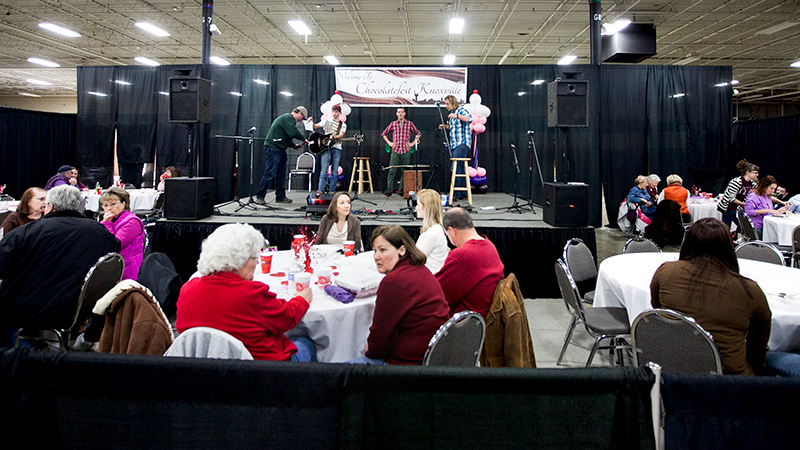 Throughout the event local artists and performers took the stage to entertain everyone. 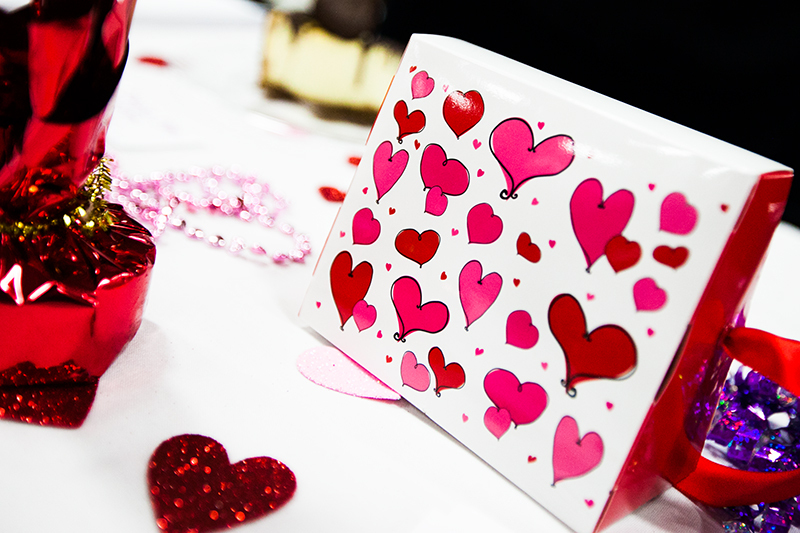 A chocolate box filled with more chocolate. 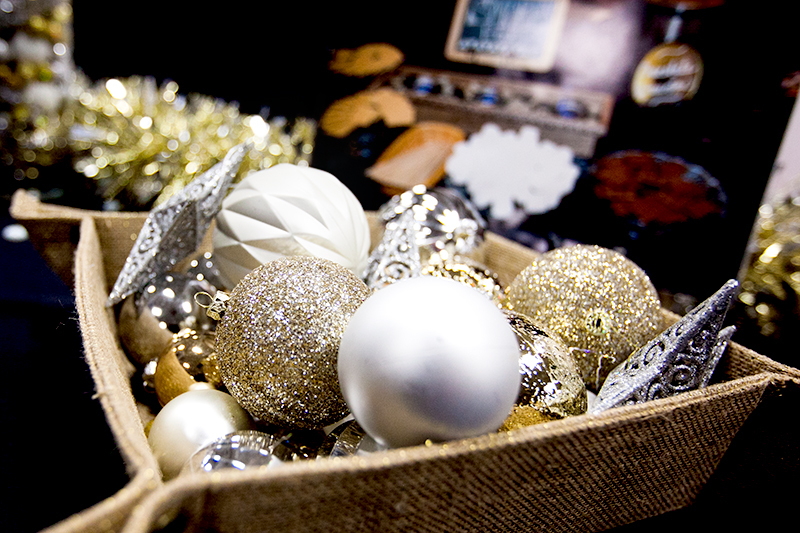 So shiny! 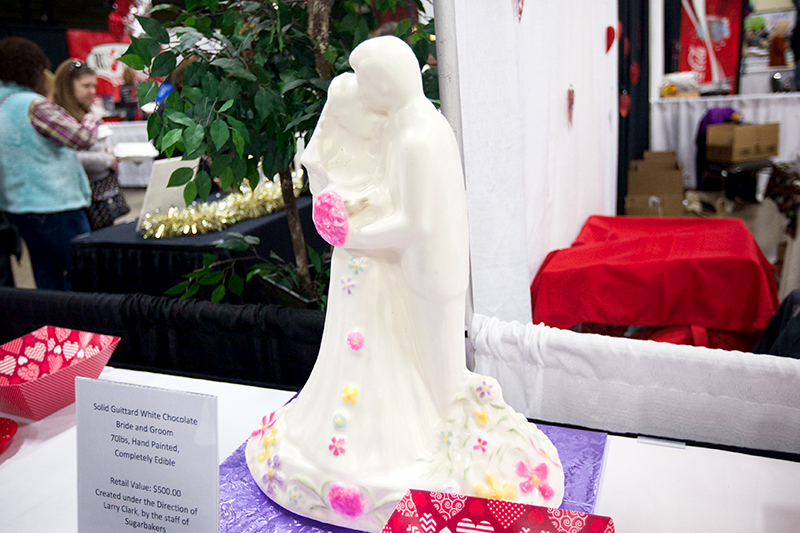 Then there was this enormous white chocolate bride and groom. 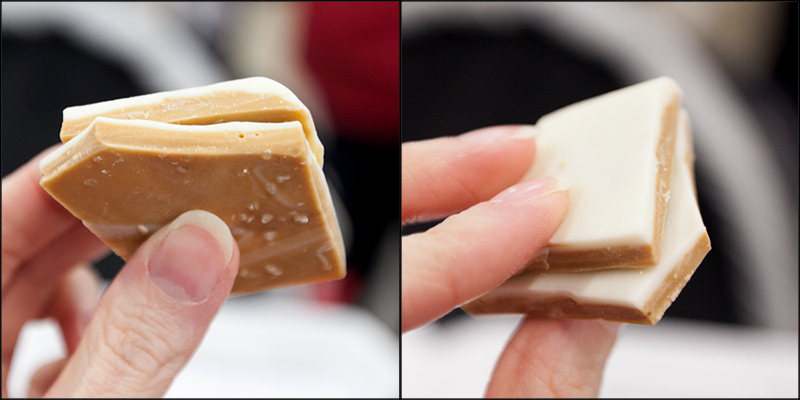 I *love* white chocolate. 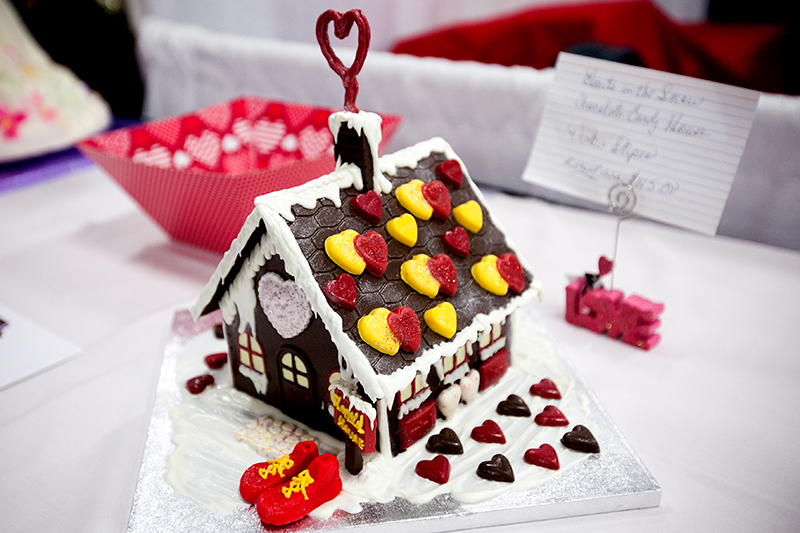 Then there was a little chocolate Ronald McDonald House – see the shoes? 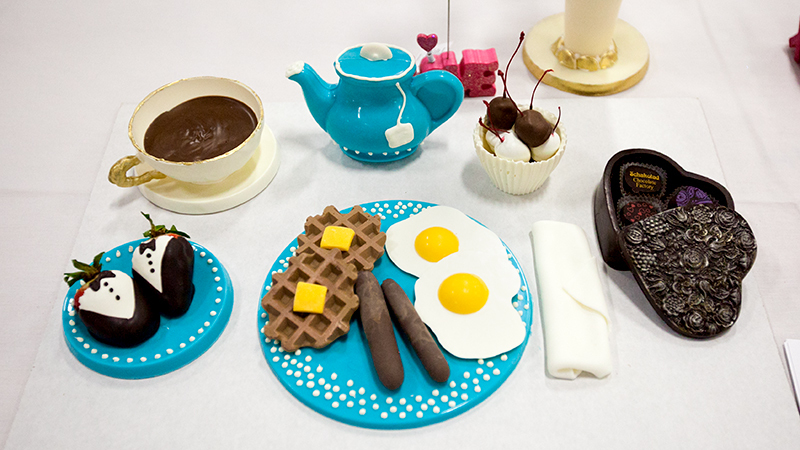 Chocolate for breakfast is always a good idea, but when even the plates, napkins, and coffee mugs are chocolate, things just get a whole lot better. 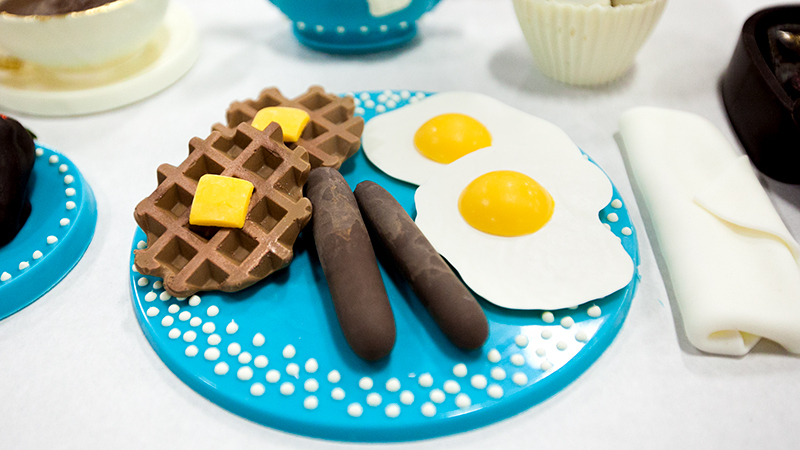 Chocolate waffles, sausages, and eggs! 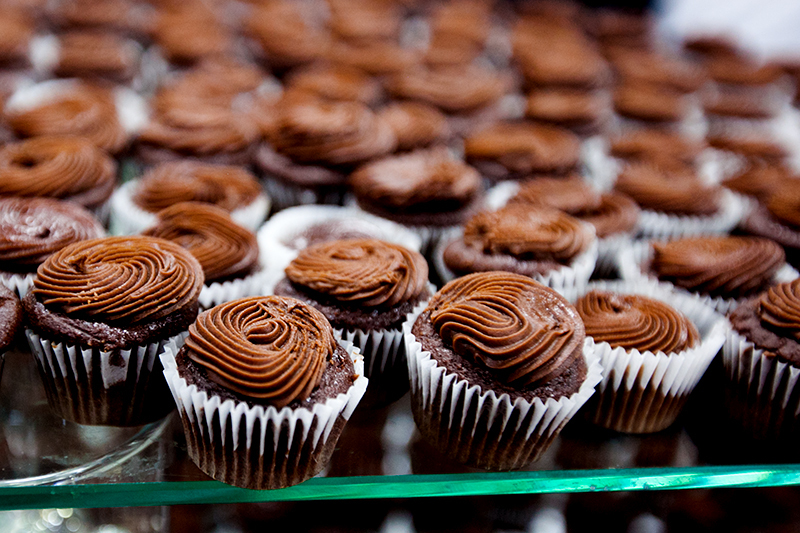 I love the little pat of butter. 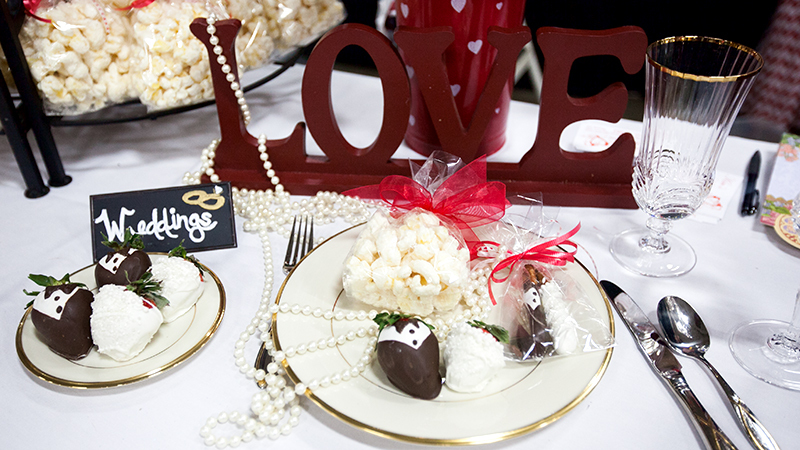 The Grande Event Center was the next chocolate vendor on our list. 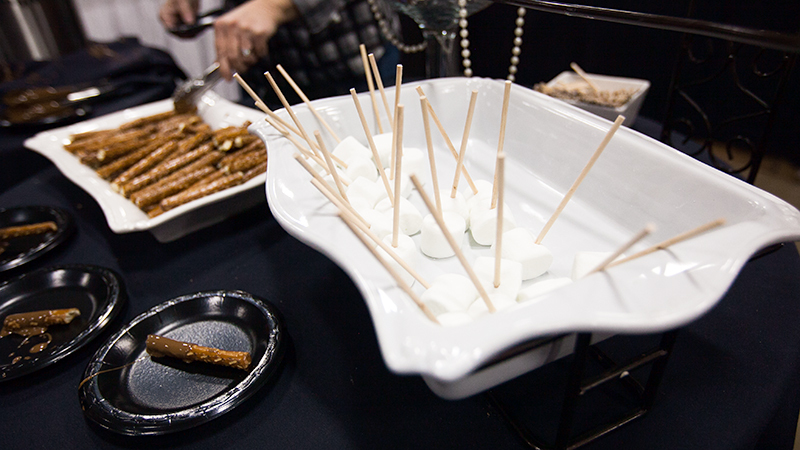 They featured a fondue fountain with marshmallows and pretzel rods to dip. 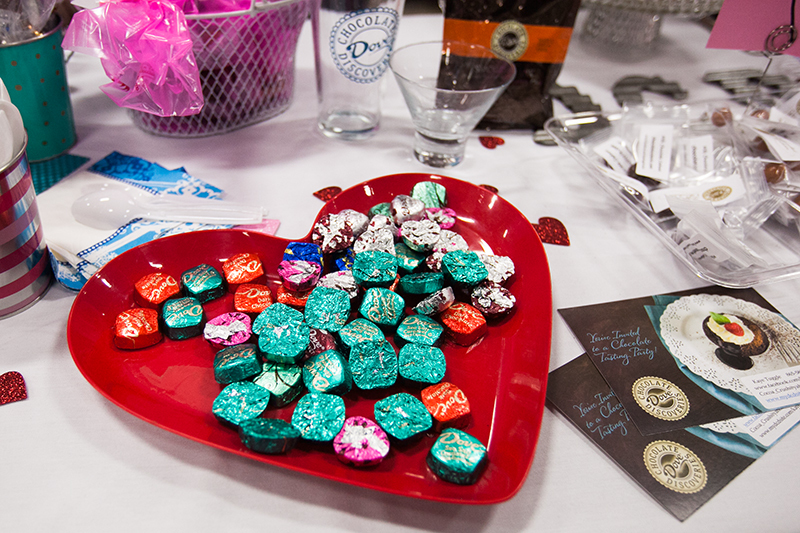 Independent sales reps from Dove Chocolate Discoveries were next – I didn’t even know that Dove had a direct sales program, so that was pretty cool to find out! 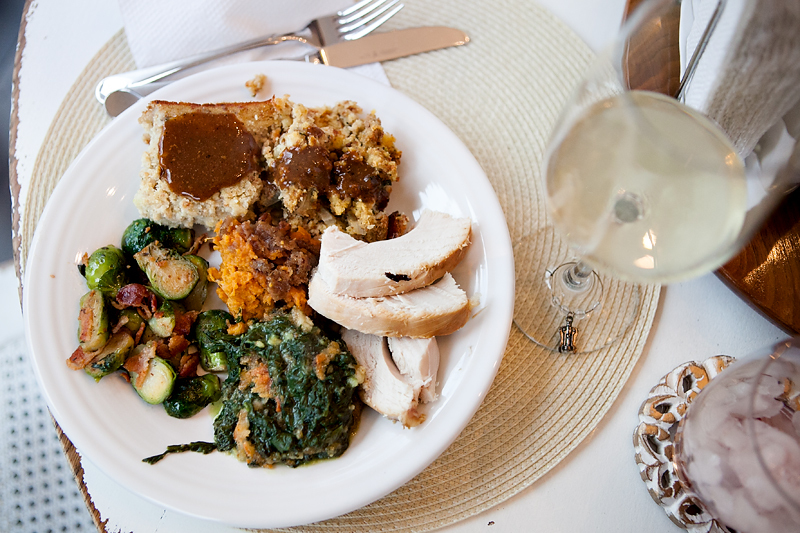 Rosa’s Catering was up next. 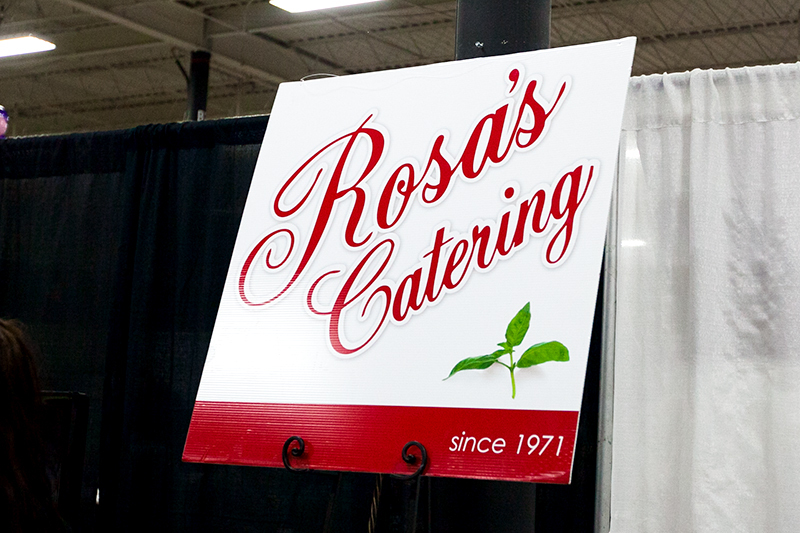 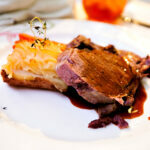 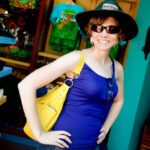 We have lots of experience with Rosa’s back in our days of photographing weddings! 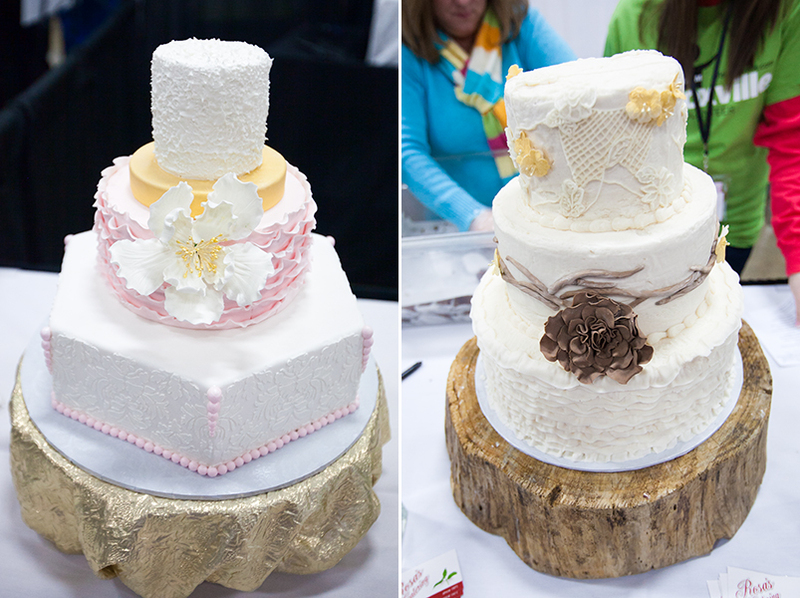 Two wedding cakes on display at the booth. 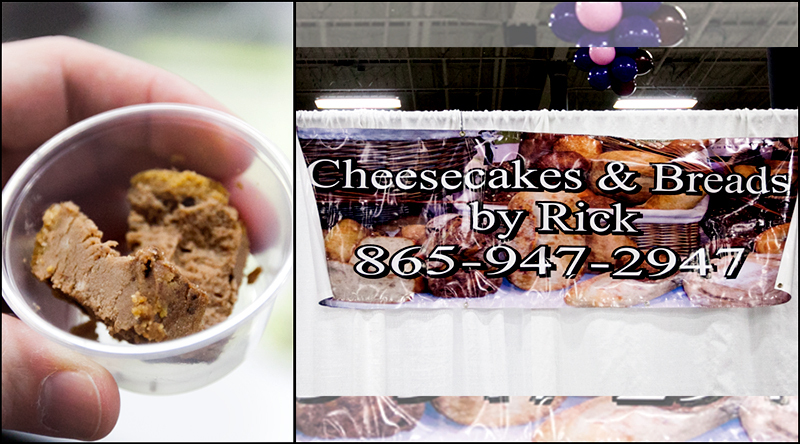 Cheesecakes & Breads by Rick specializes in award-winning cheesecakes, artisan breads, and sweet goods. 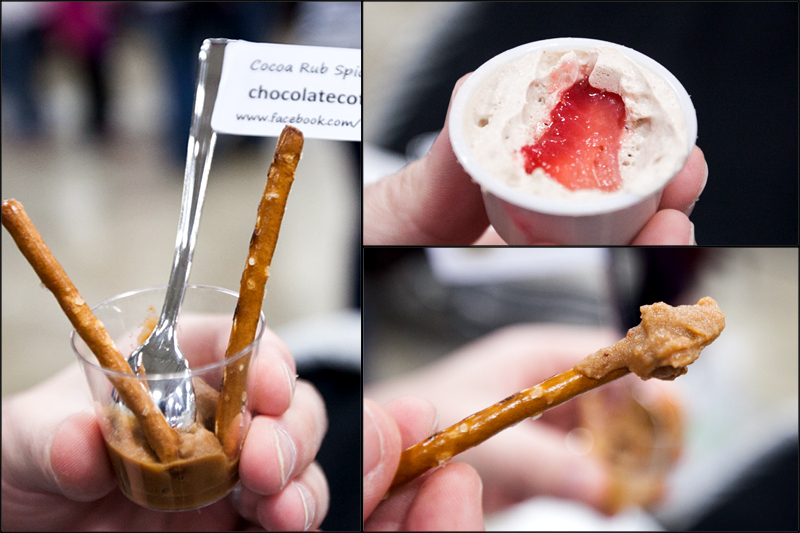 They were sampling pieces of chocolate cheesecake. 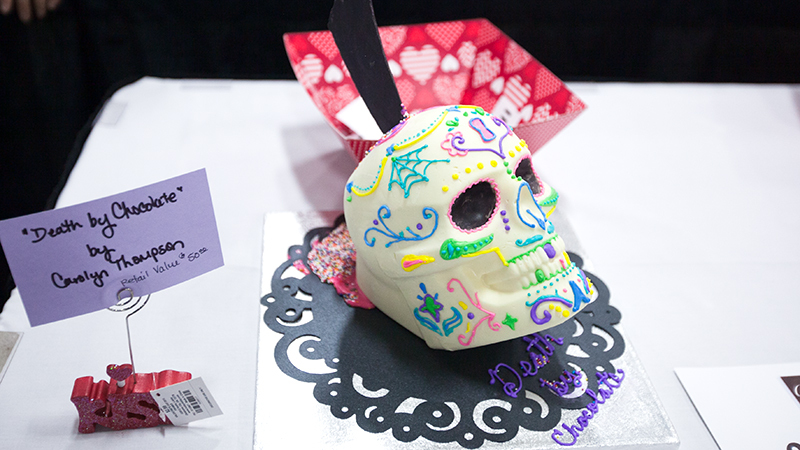 Sweetly Done showed up with a fun Valentine’s Day themed booth. 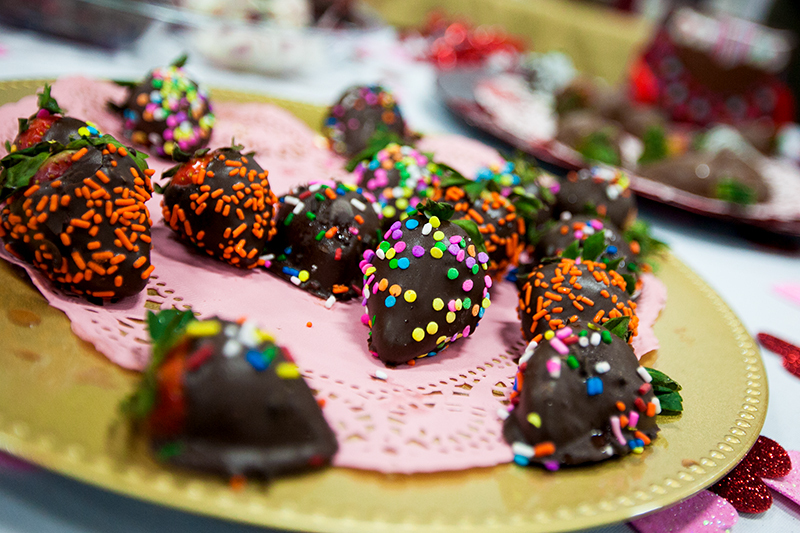 They were sampling strawberries, cherries, and raspberries covered in dark, milk or white chocolate. 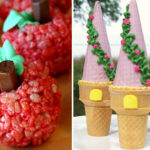 Candy by Ro does special occasion candy and molded chocolates. 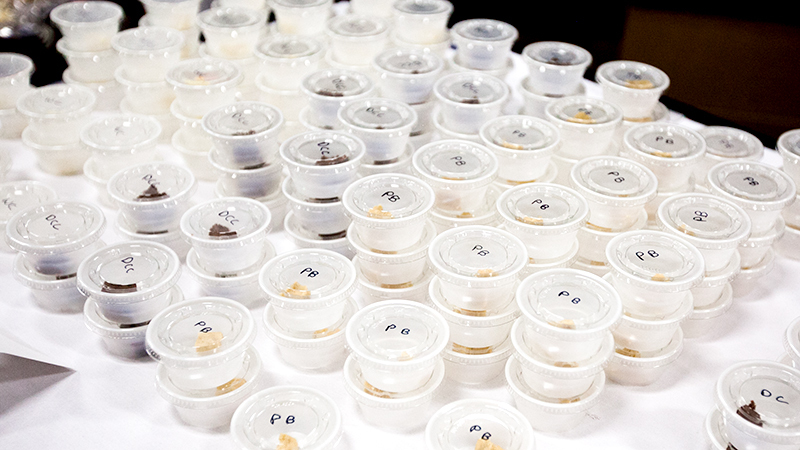 They were sampling some of their fudge flavors. 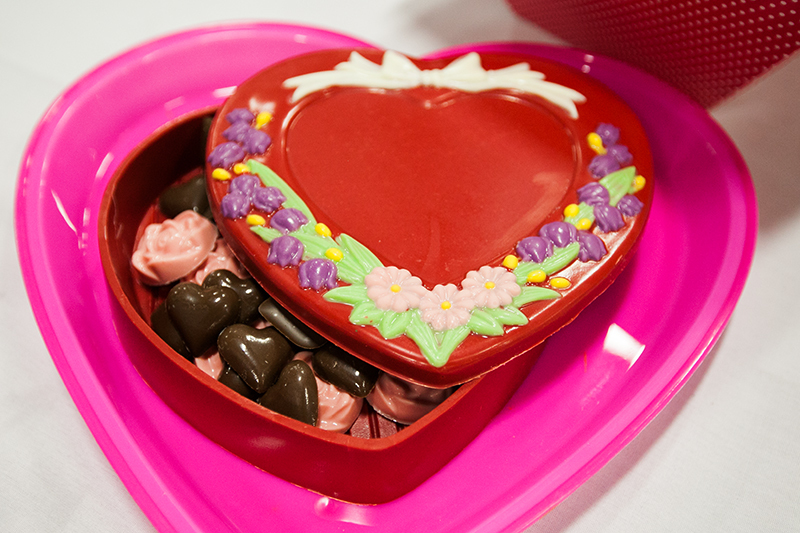 They also had examples of their molded chocolate suckers and bouquets for sale. 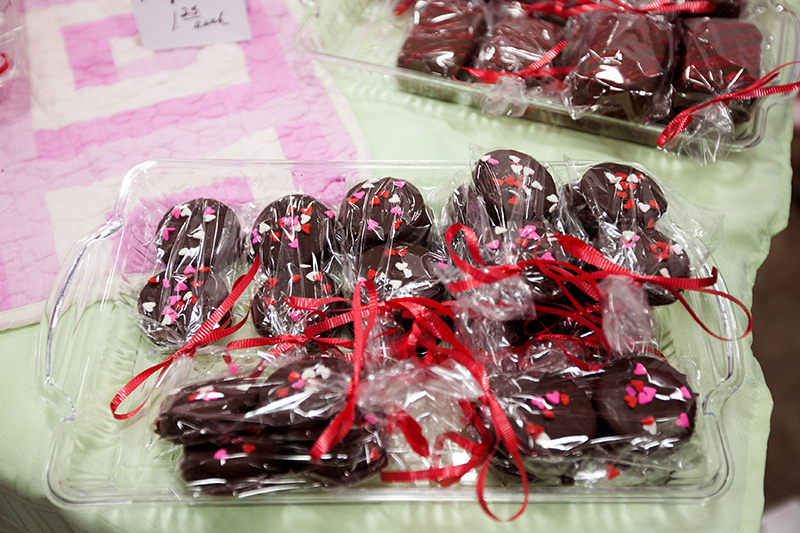 The Chocolate Ladies were selling tasty treats such as chocolate covered Ritz and Oreo cookies with fun Valentine’s Day sprinkles. 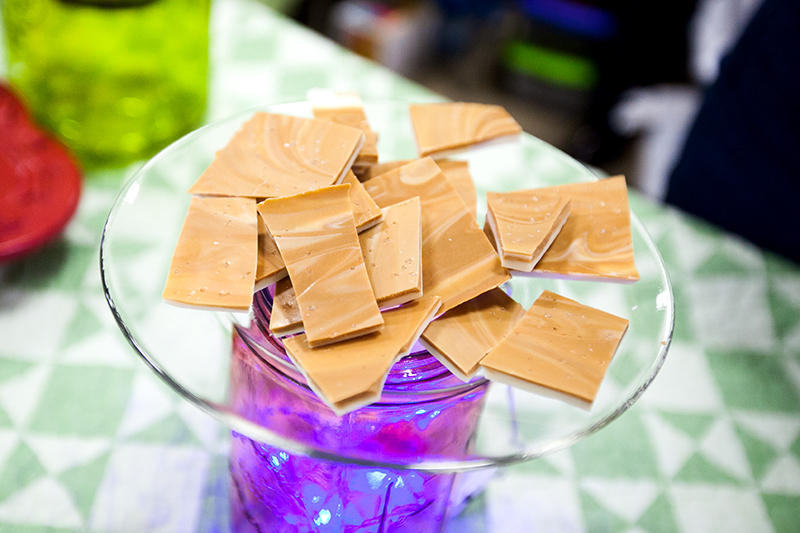 They were sampling pieces of candy bark such as white chocolate, caramel, and milk chocolate. 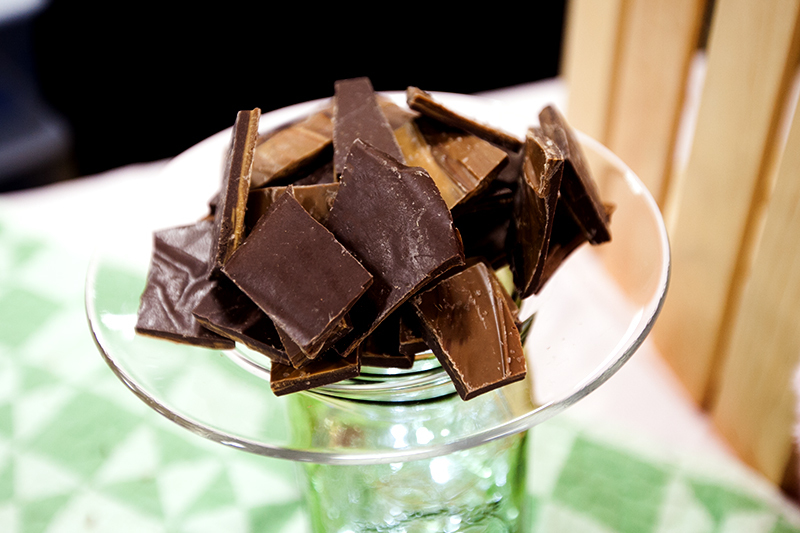 Can’t go wrong with bark – it’s one of my favorite types of candies! 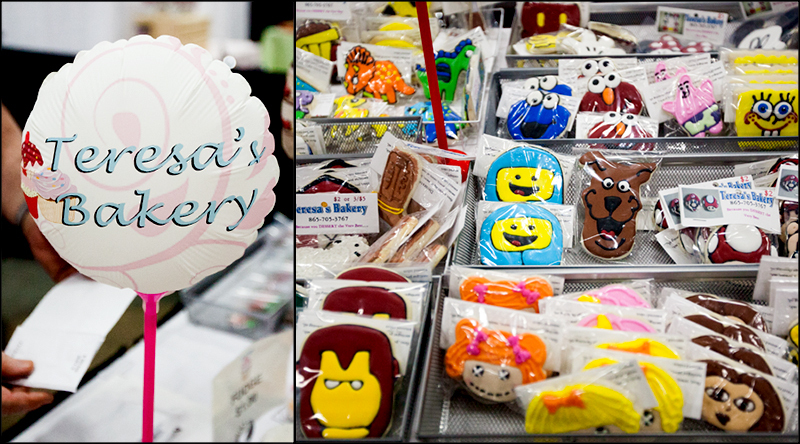 Teresa’s Bakery had a big display of adorable pipe-and-flood decorated cookies. 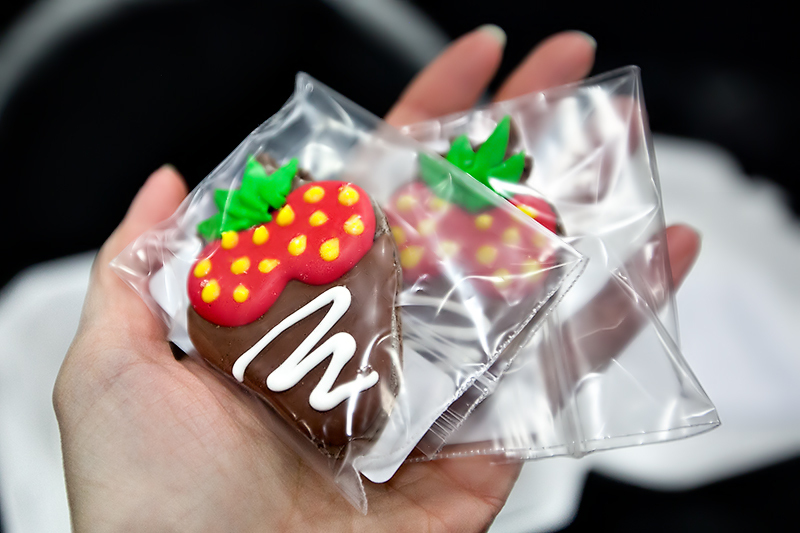 They were sampling these lovely decorated chocolate treats – so cute. 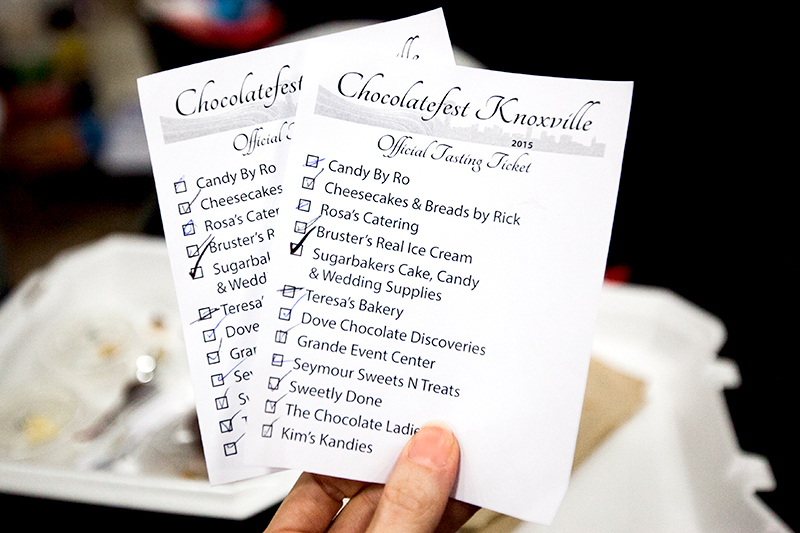 Here’s our completed checklist after visiting all of the chocolate vendors and collecting our samples. 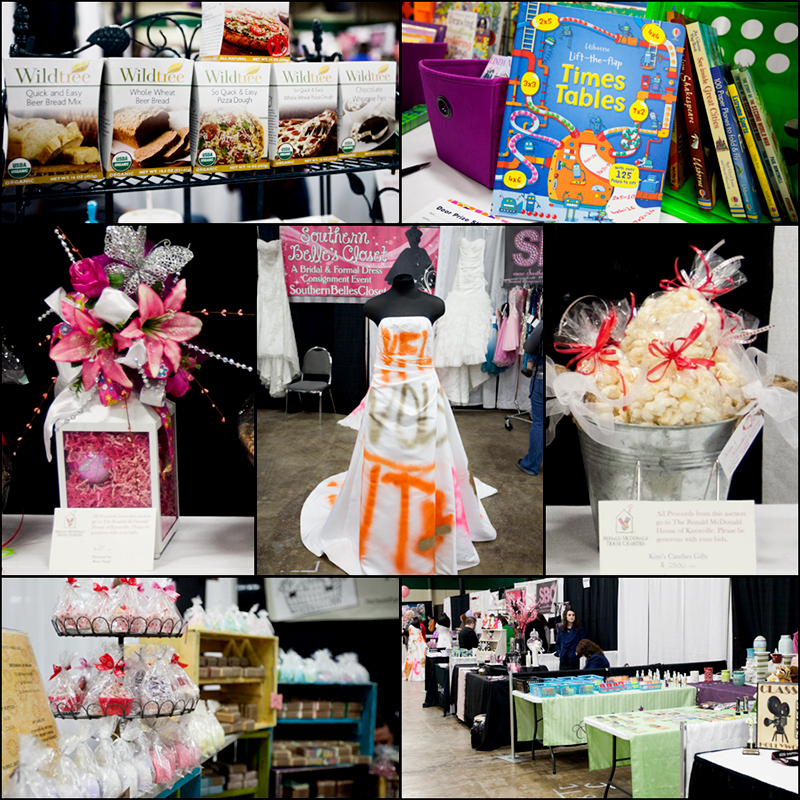 In addition to the chocolate vendors there was a silent auction (all proceeds went to charity) and several shopping booths. 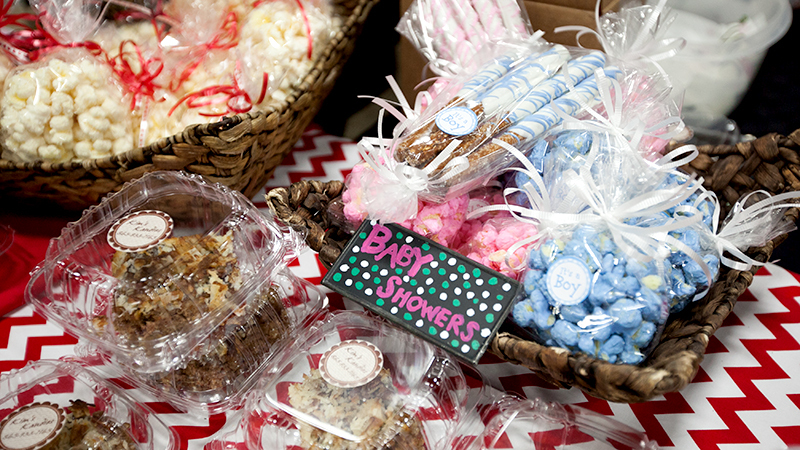 Here’s a list of the non-food vendors that were there. 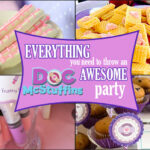 I don’t have links to all of the independent consultants so if you know which specific consultant was there at the event, let me know so I can credit them!